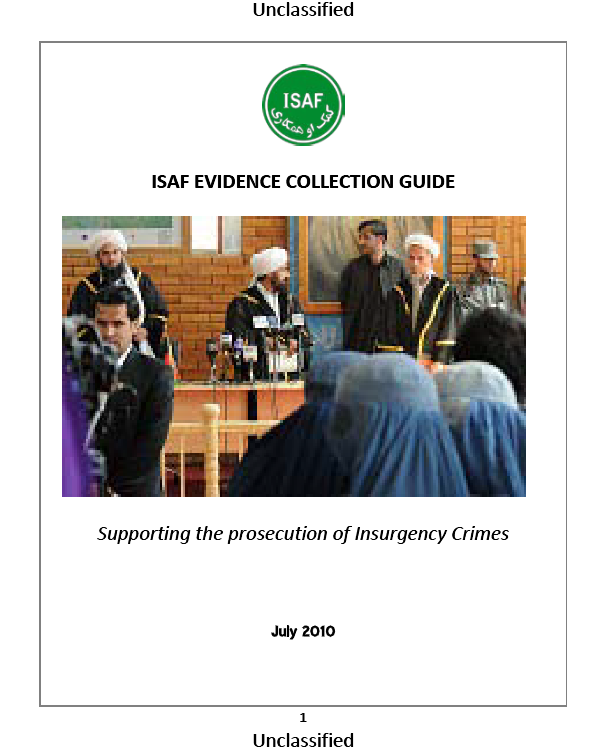 For the National Security Prosecutor’s Unit (NSPU) or a provincial court to prosecute and convict detainees, including Afghan murder suspects or National Security criminals, capturing units must provide evidence and witness statements against the suspects for use in an Afghan court of law. Appropriate evidence collection may result in admissible evidence in support of effective prosecutions. Turn all evidence associated with the suspect over to Afghan authorities and obtain a thoroughly documented receipt for the evidence. Evidence collection may also be necessary without an actual detention. Operators may find weapons, documents, or other items that should be collected as evidence, even if no one is detained. To the greatest extent possible, in order to increase the likelihood of admissibility in the Afghan courts, evidence collection and case preparation should be performed by Afghan partnering forces. This booklet is a guide. Your local prosecutor or judge may require a slightly different format or type of evidence. Your evidence may be tailored to fit your local court’s requirements if necessary. Each tactical unit conducting an operation will appoint an evidence collection team (a.k.a. Site Exploitation (SE) team) who will plan for, collect, receive, and handle all evidence seized during the operation. This team will be properly trained on evidence collection and handling procedures and will include an Afghan partnering member. Whenever possible, obtain a search warrant before an operation where you plan to collect evidence. If the warrant is not obtained in advance, your unit should ensure that a warrant is obtained after the operation.